Why do teenagers use drugs, what happens to them when they do, and what can we do about it? Venturing into uncharted territory, mother and award-winning journalist Meredith Maran takes us inside teenagers' hearts, minds, and central nervous systems to explore the causes and consequences of our nation's drug crisis. In these pages we get to know the kids, the parents, the therapists, and the drug treatment programs at their best and worst. We're face-to-face with seventeen-year-old Mike, whose life revolves around selling, smoking, and snorting speed; fifteen-year-old Tristan -- the boy next door -- who can't get enough pot, pills, or vodka; and sixteen-year-old Zalika, a runaway, crack dealer, and prostitute since the age of twelve. In their relapses and rebounds we witness the anguish and resilience of teenagers in trouble -- a fact of life for far too many American families today. 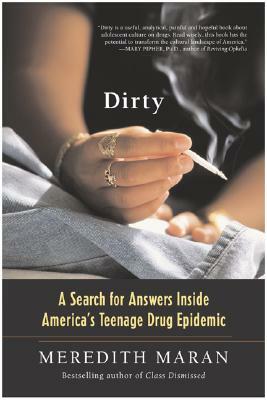 Combining powerful on-the-street reporting, groundbreaking research, and Maran's own mothering story, Dirty is essential reading for every parent and professional who works with or cares about children or teenagers. Description: First edition, first printing. Brand new book. Ships same or next day.